I bought this book yesterday at my local stained glass supply shop. They actually have a zillion little ‘gifts’ and decorations, but that’s not what interests me. My money usually goes for the colored glass. 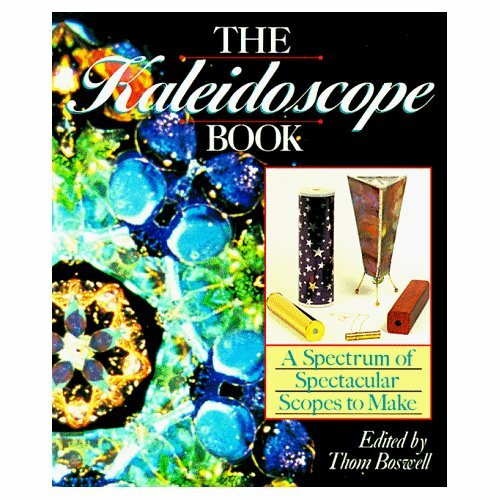 Yesterday, I bought a book, The Kaleidoscope Book. I’d like to try out a few of the ideas in the book. I love wood, too, so I’d especially like to make a kaleidoscope with a wooden exterior. And, there’s a neat one for kids that’s on a platform (it’s BIG!). You make the mirror-tube out of PVC pipe (and, decorate it, of course). The turning objects are on a lazy-Susan (the type you’d use for spices or other small items in a kitchen cabinet). And, there’s a scope of stained glass that’s on legs and points straight down (you just turn a ball of blown glass at the end of it). This entry was posted on July 9, 2008 at 9:52 pm and is filed under Copper Foil Method, Kaleidoscopes, Mirrors. You can follow any responses to this entry through the RSS 2.0 feed. You can leave a response, or trackback from your own site.